Lotus flowers play an important role and special position in both Vietnamese spirit and culture. From long time ago up to now, lotus flowers have been in Vietnamese people’s hearts, life and culture. Contemplating lotus flowers, we can see and realize images of Vietnamese people. Although it grows in mud, it is not be polluted. But in contrast, it can change its living environment; every where it grows, it turns turbid water into clear one. Lotus flowers have both scent and beauty, but the scent of lotus is not too strong, so it shows a noble spirit. 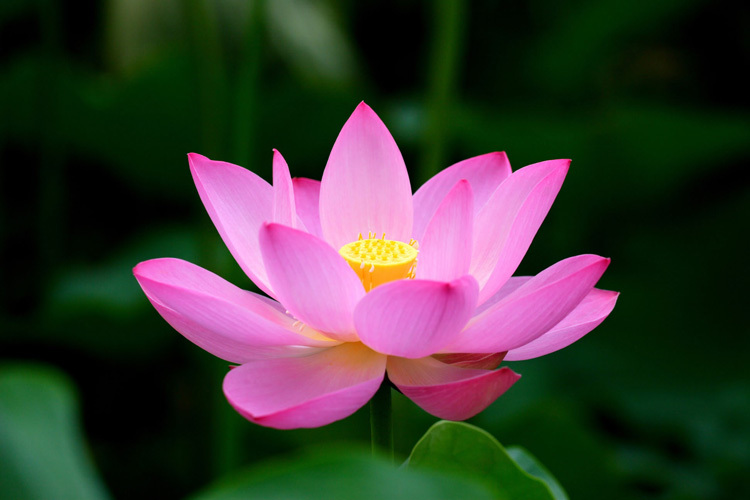 In addition, lotus flowers have their hidden beauty with pink petals and yellow pistil. Especially, it is not be disturbed by any bee and butterfly from blooming to falling time. Overcoming binding to find airy space, lotus flowers continue to spreading under sunlight, blooming, and emit its scent in surrounding space. Hometown of the late president Ho Chi Minh names Lotus Village and behalf lotus flowers are most beautiful when it is compared with the image of Uncle Ho- the beloved elderly father and leader of Vietnam. In Vietnam, subjects of lotus appeared very early in visual arts, namely decorated items in worshipping places or public cultural works. Lotus flowers are reflected in many different layouts and perspectives and appear constantly along the length of the national history through architectural works. From influence on spiritual life, Vietnamese people have taken the lotus to the top of cuisine culture. All parts of lotus flowers are processed into typical dishes such as lotus stem salad, lotus seed jam and lotus tea. Lotus flowers in Tinh Tam lake of the Old Hue Capital are served for kings in the past. People made lotus-scented tea at night. The time lotus flowers just unveiled its pistil is when heaven and earth are reconciled. Tea is placed inside lotus flower and then tied in order to be forced not to bloom out, after a night after; tea will absorb the full lotus flavor. Up to now, international friends know Vietnam with the first image “golden lotus flower” on their flights of Vietnamairlines; the image represents enlightenment and perfection; simple but noble and sacred; charming and gentle but still dignified and serious, representing courageous Vietnam people but friendly and open-hearted.